Today we have the lovely Michelle with us from Avery and Augustine. She is an SLP (speech-language pathologist) and photographer, as well as a blogger. 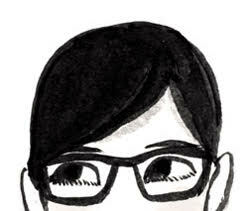 If you aren't familiar with her work already, we suggest you take a peek at her blog Avery and Augustine or follow her on Instagram @averyandaugustine where you are sure to find a myriad of book selections that you will immediately want to acquire. She also collaborates with an amazing group of educators, librarians, writers and artists on the Little Lit Book Series. They share carefully curated books on different themes each month on a dedicated instagram account @littlelitbookseries (there's also a blog, too). Michelle started blogging about picture books over 7 years ago when she first started Avery and Augustine. She says, "I wanted to share different moments and aspects of Avery's life, including the toys and books she liked-- in order to share the information with other curious parents as well as document her life a bit. I'm big on documenting through pictures and words, and always have been. For the longest time, I wanted to be a photojournalist. Photojournalism is still my favorite genre of photography." Read on for some wonderful insights and a list of must have books from 2016. How many kids do you have? I have two children, Avery (8) and Nate (5). Where do you live? We live in Southern California. I always thought I would end up moving far away and living in another state or country, but I ended up not too far from where I grew up. What are three ways you foster reading in your home? 1. We read aloud to Avery and Nate as much as possible. Sometimes its not quite every day, but we try to do it consistently, like at least four to five times a week. But to be honest, it varies from week to week depending on our schedule. 2. I try to understand what genres of books Avery and Nate gravitate towards. I search out those types of books and try to have as many of them as possible at home (although I do try to have them read widely across genres and expose them to as many types of books as possible). For Avery, my independent reader, I make sure to choose books at or just above her reading level, because if they're too difficult for her to understand, she won't engage with the story and will lose interest. If I happen to buy a book that turns out to be way above her independent reading level, we'll try it out as a read-aloud and we'll talk about the words she doesn't understand. Or we'll save it for a later date, when she's ready for it. I think it's important to have your own collection of books at home (although the library is such an amazing resource) because when kids have down time, they are more likely to reach over and grab something off the shelf to read. Then they are able to pick up a particular book whenever they want and they have more time to really think about it and mull it over. Kids need to read a book over and over again (not just once or twice) for them to absorb the language, vocabulary, narrative, themes and all the goodness a book has to offer; the narrative becomes part of their experience and background knowledge and it sometimes launches new ideas for them or opportunities for creativity. 3. We keep bins and stacks of books in almost every room of the house, so a good book is almost always within reach no matter where the kids are. We also keep blank paper, notebooks, writing utensils and art supplies out in the open so that Avery and Nate can engage in authentic writing (writing with a purpose) whenever the mood strikes, be it writing a letter to someone, jotting down a list of things to buy for a party or making a sign for their latest pretend bakery or macaron shop. We do this because research has shown that writing (engaging in the writing process and practicing writing) helps strengthen reading skills (and vice versa, of course). 4. Like Jim Trelease, author of The Read Aloud Handbook recommends, having a little bedside reading light has worked really well for getting in some extra reading time before going to sleep. Avery and Nate feel like getting to stay up a little longer and use their reading light is a special thing and those few extra minutes of reading right before bed become a great time for them to bond with their books and stories. The trick is to get them to bed a little earlier, so their reading time doesn't cut into their sleeping time. 5. We turn on the closed captioning on our television (also a recommendation from Jim Trelease) so that Avery and Nate are exposed to words and text while watching shows. As he said, it's as if your TV is "reading aloud" or narrating while your kids are getting visual input at the same time. Is also provides extra opportunities for reading practice--when we first turned it on, Avery was really interested in seeing the words and sentences on the screen and drawn to them. She loved reading them and was excited and proud that she was able to recognize words that she was learning at school. The more print-rich you can make your home environment, the better! I guess that was more than 3 ways! A lot came to mind. 1- Today by Julie Morstad. In her natural and effortless way, Julie Morstad shows us the beauty of the quotidian, its moments of whimsy and its potential to surprise us with something extraordinary. But how? She helps us revel in the possibilities of today. What should we wear? What should we eat for breakfast? Porridge or pizza? Where should we go? For a walk in the woods or to the museum? How will we get there? By bike or dancing our way there? She reminds us that each day is remarkable in its own right. 2- Samson in the Snow by Philip C. Stead. A story cloaked in frigid white snow but warmed by sweet, unexpected friendship. Philip C. Stead's book dedication is so fitting -- "To anyone who is having a bad day." There's a quiet, contemplative quality to his illustrations and a great vastness in his snowy landscapes that envelops the reader as they're pulled into the narrative. You can almost hear the hushed silence of the snow and the soft crunching of footsteps in it. The thoughtful writing will sink in and settle into your soul after a few good readings. 3- The Cookie Fiasco by Dan Santat. Nate's proclamation after his first time listening to The Cookie Fiasco -- "Read it again!" It's a hilarious start to the new Elephant and Piggie Like Reading! series. The Cookie Fiasco is about a serious quandary, a hippo with a nervous habit and how things sometimes work out in the end on their own. The dialogue, layout, play with type -- all genius. 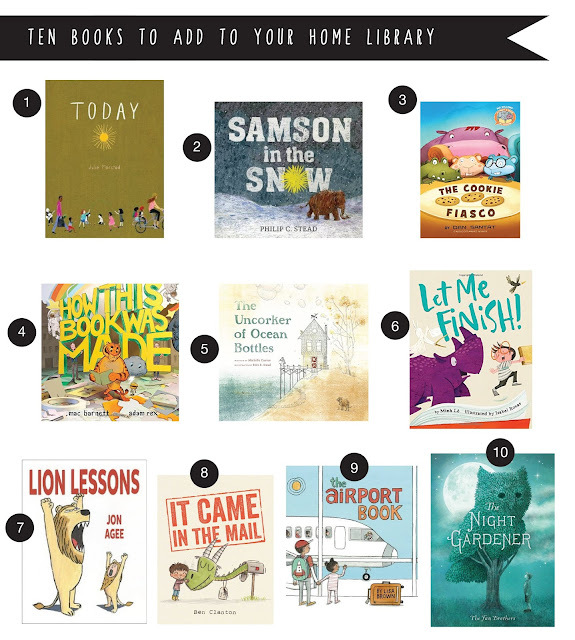 It's easily one of the most engaging early readers we read last year. 4- How This Book Was Made by Mac Barnett and Adam Rex. Mac Barnett and Adam Rex team up again, this time to elucidate the lengthy process of putting a book out into the world. They deliver many wry insights into the countless drafts, dozens of people and slow boats that bring books to our shelves. The narrative achieves a good momentum and is not deterred even when a livid tiger and swarthy pirates are encountered. Funny and smart in the best way possible. We're almost tearful that the story is over. Hoping for a sequel, or at least another MacAdam Production. 5- The Uncorker of Ocean Bottles by Michelle Cuevas and Erin E. Stead. A wispy and ethereal story of wonder and unexpected friendship. The sea-worn foggy texture of Erin Stead's illustrations befit Michelle Cuevas' affecting, hauntingly beautiful text. A serious contender for best picture book published in 2016. 6- Let Me Finish by Minh Le and Isabel Roxas. Seriously clever interaction between word, picture, texture and design. If you don't normally like "doing all the voices" when reading a book aloud, this one might just compel you to. Note from Tee & Penguin: Check out all the insider details on this book from Michelle's interview with the author and the illustrator here. 7- Lion Lessons by Jon Agee. Lion Lessons: crazy and absurd premise, and utterly hilarious with the dry humor that only Jon Agee can deliver. 8- It Came in the Mail by Ben Clanton. If we only received more mail like this. It Came in the Mail is about a mail-loving boy, an obliging mailbox and some magic. It's full of playful references, subplots, some pretty rad onomatopoeia and clever wordplay. 9- The Airport Book by Lisa Brown. I like all of the aspects of Lisa Browns newest work -- the content, the color palette, her illustration style -- but I love the design and composition of the page spreads the most. She really captures the bigness and airiness of an airport, with its comings and goings and ubiquitous swarms of people. When I first flipped through its pages, I had flashbacks of memorable times spent in airports -- waiting, breathing in all the activity, getting lost in the sea of background noise, walking around and looking up at everything. 10- The Night Gardener by Eric and Terry Fan. A mysterious individual changes the glum town of Grimloch and an orphan boy's life forever when he sculpts a series of enormous and breathtaking topiaries out of the town's trees late at night. A truly magical story about kindness, artistry and inspiration. The Night Gardener is Canadian illustrators Terry Fan and Eric Fan's first children's book. Let it not be their last! What did your parents do to promote childhood reading in your home? They knew the importance of education and read aloud to me, although I don't remember how often. We had a small library of books at home, for sure. Now that I'm thinking about it, one of the books that we had was Richard Scarry's Best Mother Goose Ever. The cover comes to mind-- I remember it pretty well. We also went to the library a LOT and checked out probably the maximum amount of books allowed per visit. Right now I'm reading aloud the Ramona series with Avery. Beverly Cleary is one of her favorite authors, and I love re-reading her stories as an adult. I couldn't get enough of Beverly Cleary when I was younger. With Nate, we're reading a lot of Syd Hoff and Elephant and Piggie books at the moment. His current favorite Mo Willems titles are We Are in a Book and the more recent Nanette's Baguette. And we read so many other picture books. It just depends on what we pull off the shelf that week. In the last month or so, he's been really into the Ready, Set, Read! anthology. Can we see a shelfie of your home library? 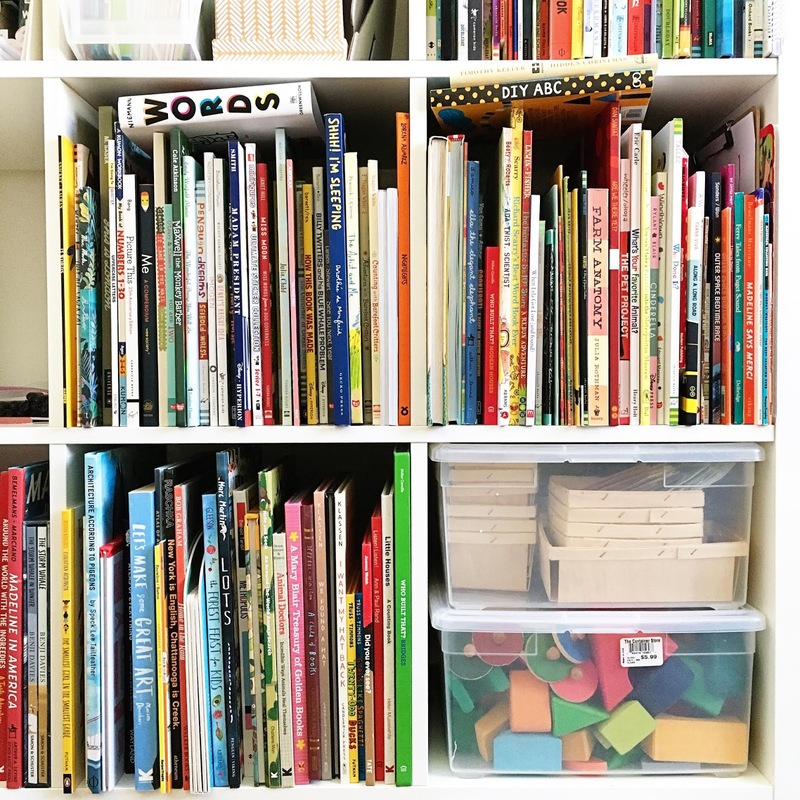 Sure, here is a picture of some of our shelves; organization is a perpetual, ongoing process. 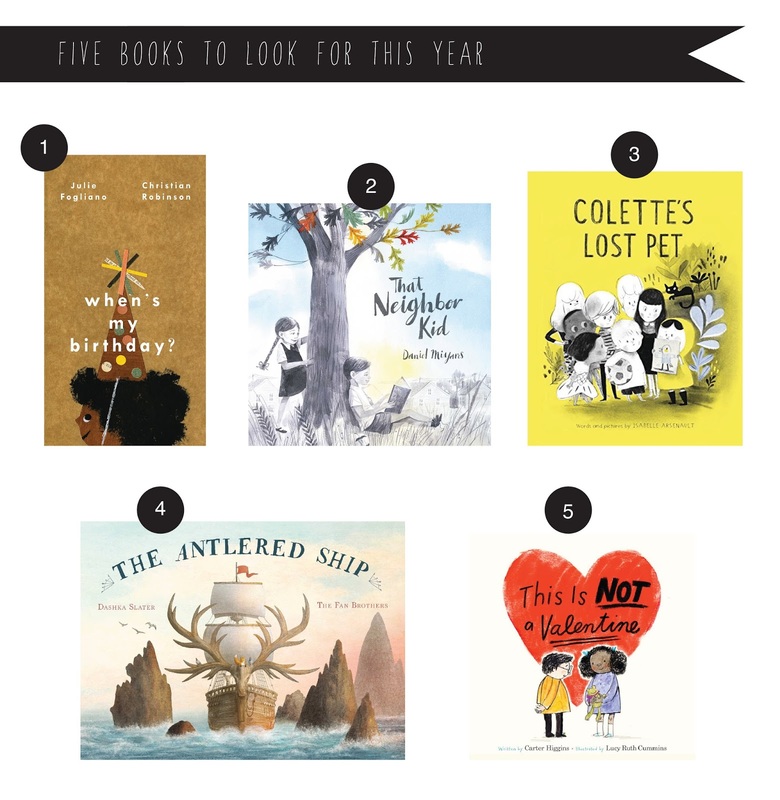 What are 5 picture books you are looking forward to in 2017? P.S. If you're interested in participating in our Reading With series please let us know!